Puerto Rican singer/songwriter Andrés Jiménez (aka El Jíbaro) arose in stature during the 1960s nueva canción movement and continued to be an influential artist in his homeland during the decades that followed, known for his patriotic sentiment and the nationalistic themes of his music. Like many Puerto Ricans, Jiménez moved to New York City, arriving at age 17; he was drafted into the U.S. Army and served in the Vietnam War. Upon his return, he enrolled at the University of Puerto Rico and joined the group Taoné, also comprised of Roy Brown, Antonio Cabán Vale (aka El Topo), Noel Hernández, Carlos Lozada,Pepe, and Flora. 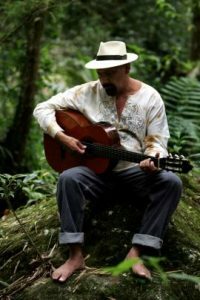 Over the years that followed, the musical style of Jiménez became steadily referred to as música jíbara (i.e., music of the poor mountain people -- or simply, Puerto Rican folk music) and he himself proudly assumed the title of El Jíbaro. One of his more readily available albums is Son de Vieques, a 2000 collaboration with fellow Puerto Rican Ismael Miranda. His 2007 album Mi Parranda proved his most commercially successful to date, registering on Billboard's Top Latin Albums chart.